I've become interested in, and begun collecting stash for my new hobby. 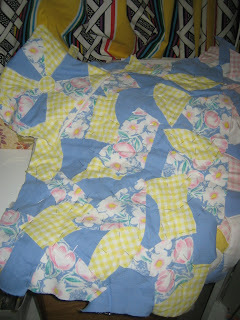 Crazy Quilting! Then last fall clean up a neighbour had a sewing machine in it's own cabinet on the side of the road. I enlisted a friend to help walk it down to my home. Recently had it in for an maintenance costing me only $12 and now I have a sewing machine I'm once again enjoying using. My first little quilt was inspired by the 2 little Winnie the Pooh pieces found in the box of fabric I received from Dodiemom. So I sat one night and pieced it together with pins. I took several short cuts by pinning it all down on one piece of fabric and then placing that on the batting and another piece of fabric and then adjusted all the pins to go thru all the layers. I then did a simple zigzag stitch on all the edges, without even folding in the edges, to give it a scrappy look and feel. 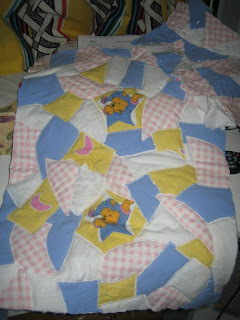 It still needs to the binding of the edges and I've pieced together a top for a pillow to go with it. This and the second one I've pieced together and pinned with the batting and backing are for doll quilts with matching pillow. I've been inspired just now by Diane's Blog and love the work I've seen on her site. I hope to one day learn some of the many stitches I seen on her site.